← A “Day” in the Life: Vicki Schuster, Multi-Tasker Extraordinaire! When our blogmeister Rachael asked us to consider writing something for Archives Month, and suggested as a theme “A Day In the Life of an Archivist,” I had two immediate thoughts: do I even qualify as an archivist any longer, now that I’ve been an archival administrator for a dozen years; and how could I describe a single day, given that no two days of my work are even vaguely similar to one another? Well, Rachael was kind enough to give me dispensation for both obstacles, so here are a few insights into what the director of a large repository does, overall, with his time. Lately I’ve been spending a good deal of time figuring out how much if any my job has changed now that I’m confined to a wheelchair. Back in late June I suffered a lumbar infarction, or spinal stroke, a rare occurrence which permanently paralyzed me below the waist. Fortunately, unlike more common brain strokes, the incident did not affect my cognition or speech. After three weeks in the hospital and four more in rehab, my strength is returning and I am able to spend more and more time in my office (though I still do some of my work from home). Since I am these days primarily an administrator, so I spend most of my work life sitting in front of a computer, attending meetings, reading reports, or having telephone conferences, all of which can be accomplished from a chair (wheeled or otherwise). Some of my travel, on campus and around the state, will have to be curtailed, at least for the immediate future, which I will miss, but all things considered it’s a pretty small inconvenience. So, then, what do I mostly do from my chair? Lately I’ve spent much time wrestling with personnel and related budget matters. Our university is facing significant budget cuts from ours state, and to get out in front of those cuts, by beginning to save money ahead of them, and to do that UW has begun carefully scrutinizing vacancies of classified staff (and employment category primarily distinguished from faculty). So I’m presently reviewing procedural documents, writing memos (including our best justifications for filling our two most critical vacant positions), and doing my best to communicate much of this to our employees. 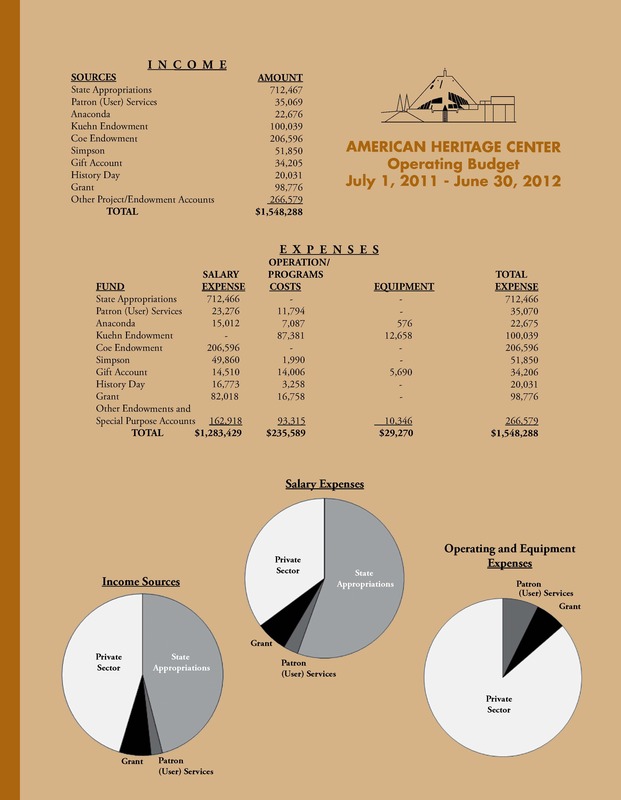 Budget from the 2012 Annual Report. In fact, I spend a fair amount of time and energy trying to see to it that our administration of the AHC is reasonably transparent, and thus that employees (both faculty and staff) receive useful and relevant information on a pretty regular basis. I’m equally committed to assisting our employees in continuing their professional education, so we are presently working out the details of bringing a Society of American Archivists (SAA) workshop here to the Center, foremost to benefit our great faculty and staff and incidentally to provide opportunities for our colleagues at places like the Wyoming State Archives and the Buffalo Bill Historical Center in Cody. The Center is also sending one of our processing archivists to rare books cataloging school, so she can assist us in speeding the online cataloging of our rare book collection. 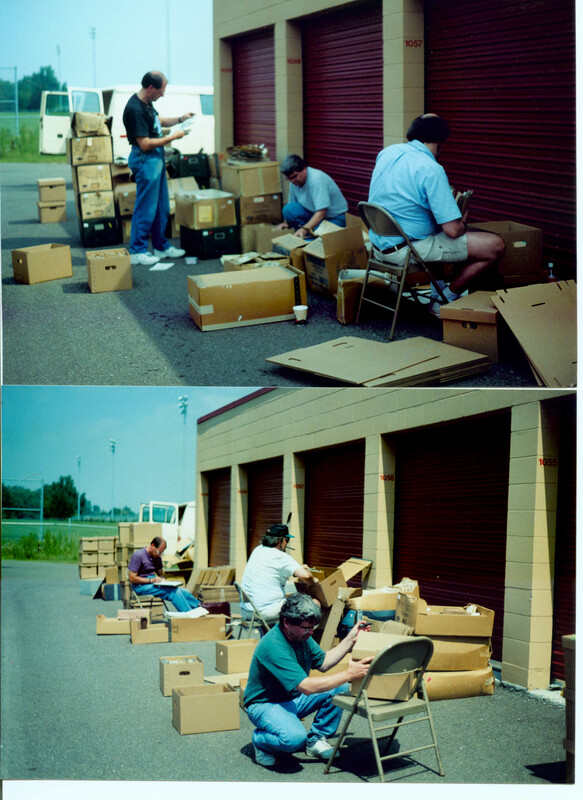 A much, much younger Mark Greene (at far back in both photos) practicing collection appraisal for the Minnesota Historical Society in the late 1990s. 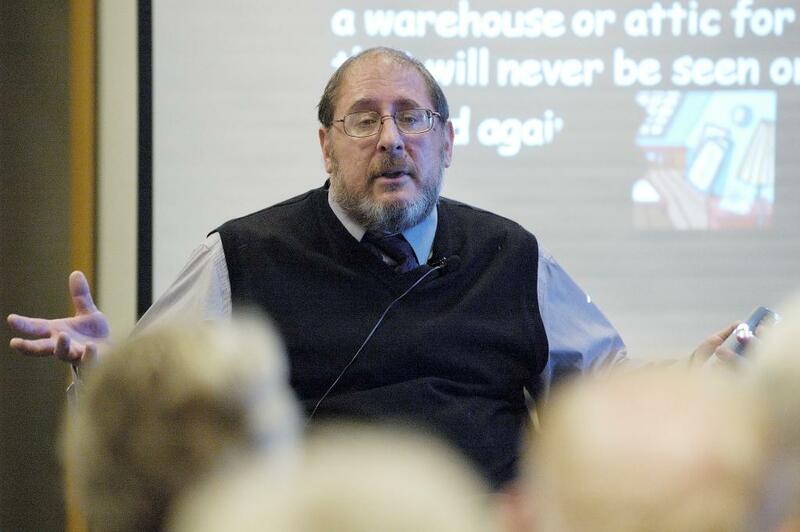 Mark presenting at the first day of the Laramie Lyceum, October 2, 2012. And in addition to addressing our own employees, we pay great attention to communicating with and helping to educate those outside the AHC—whether new faculty at UW or members of the lay community. So, early in October we kicked off a series of invited presentations to the Laramie Lyceum on the various aspects and programs of the Center. We gave a similar, though shorter, version of this presentation to citizens of Sheridan, WY, earlier this year. In fact, I spend additional time during the year working on other forms of outreach for the AHC, from brochures and flyers, to email messages to new teaching faculty at UW, to press releases, to, yes, blog posts. 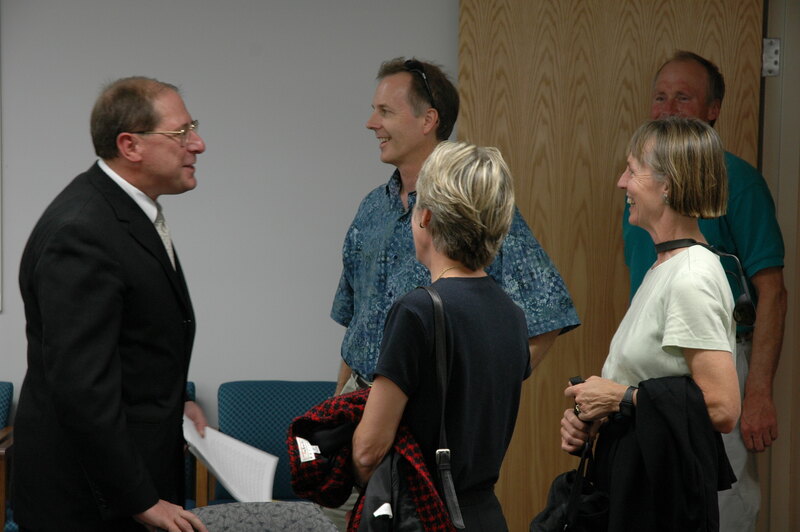 Director Mark Greene meeting with donors at the AHC. More than all these activities combined I am involved in raising private funds for the Center, from annual gifts of under $1500, to “major” gifts of more than $1500, to endowments, to planned gifts and bequests. We are extraordinarily lucky to have so many generous supporters and friends who, even during this dismal economy, have done an amazing job in sustaining our work. Fully 55% of our budget comes from private sources, so such gifts from the smallest to the largest are absolutely essential for our ability to thrive as a repository. We cannot adequately express our appreciation for the philanthropy, modest and great, of our followers. Thank you! Finally, for now, what trumps all the other engagements on my calendar (aside, of course, for meetings, meetings, and more meetings, all aimed at the previous activities or those that follow) is working with my colleagues at the AHC to plan and set directions and goals for the Center. Planning certainly includes budget, but much more than that. UW is committed to a series of five-year strategic plans, which unlike at many institutions are closely monitored for accomplishment rather than set on the shelf and forgotten. Our most recent strategic plan will begin this next calendar year (our current one is online), and kick-off with an AHC all-staff retreat. The plan does guide our long-term actions and goals, but cannot encompass all eventualities or opportunities. For example, from our current plan we have fully accomplished four items, partially accomplished three items, but made little progress on the final two items. On the other hand, we have accomplished a great deal not listed on the plan and impossible to foresee during our planning process. One item we have largely accomplished regards our scanning operations. We are strongly committed to maintaining and even expanding our efforts at mass digitization, to put more and more of our holdings directly online. And while it will take, even at our professionally efficient pace some 5,000 years to scan all of our 18 miles of collection material, we can certainly make a dent. That will require both additional equipment and, eventually, additional staffing, even if only part-time. We have succeeded less in our efforts to ramp up our capabilities in accessioning, describing, preserving, and making accessible so-called born-digital records—materials from spreadsheets to word documents to blogs to twitter feeds to family newsletters and organizational reports—that are never printed to paper but exist only as bits and bytes on a hard-drive somewhere. Working efficiently and effectively with such material is the archival profession’s single largest challenge—that and ensuring that an ever-wider universe of users is both aware of our holdings and able to access them. 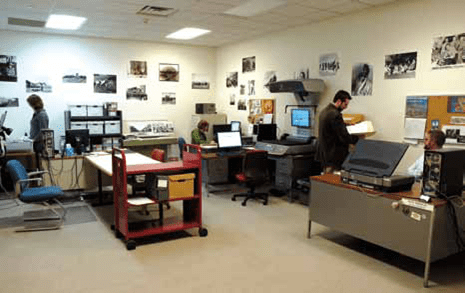 The AHC’s state of the art digitization lab. So what, if any, archival functions do I still perform; functions that keep me from being purely a bureaucrat? For one thing there’s helping to set direction and goals for archival work such as processing and cataloging collections, certain aspects of reference activities, etc. I am also partly active in soliciting and responding to offers of collections for the Center, sometimes requiring extensive conversations or even visits with prospective donors. On a few of those occasions I even am able to assess (appraise) the historical importance of the material, something that was a mainstay of my work during the eleven years I spent as curator of manuscripts acquisitions at the Minnesota Historical Society. I also try to work with some of our existing donors to elicit their assistance in suggesting donation of papers to the AHC to their friends and associates, an effort that has over the years borne some substantial fruit. I’ve gone one far too long, I suspect. I also spend a bit of my time working on efforts to assist the archival profession as a whole, though most of that is limited to my “free” time. I’ve been fortunate to have been able to serve the archival community in a number of ways, and I hope to be able to continue to do so. Most recently I was asked by the Society of American Archivists’ current president to assist in drafting a letter to Georgia’s governor, protesting his administration’s decision to effectively close the state archives, making it difficult if not impossible for citizens to gain access to the public records of their state government. Public access to public records is a major advocacy theme for SAA, non-partisan and several decades old. I also plan to continue to serve the AHC and the University of Wyoming for some time to come, in all the myriad methods a unit director (and part-time archivist) must employ and all the variety of purposes he or she must pursue. 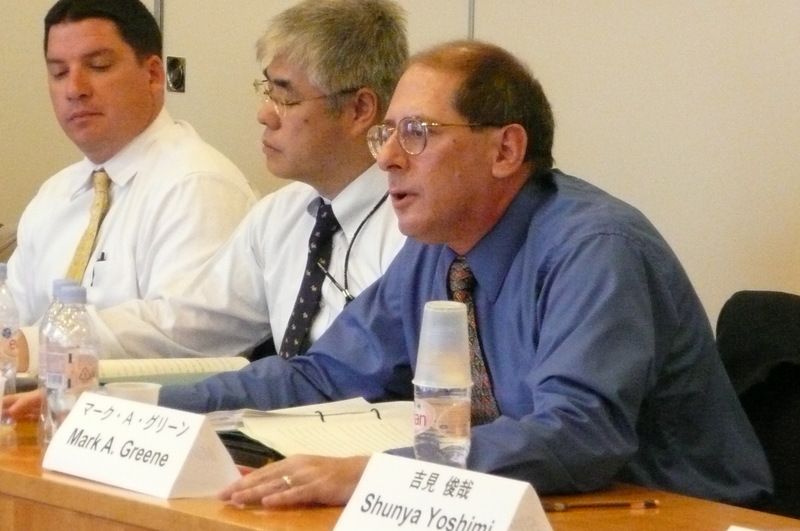 Mark representing the Society of American Archivists at a bilateral professional conference in Tokyo.